Pursuant to Regulation (EC) No 223/2009 of the European Parliament and of the Council of 11 March 2009 on European statistics ( 2 ), a multiannual European statistical programme (the ‘multiannual programme’) should be established, providing a framework for funding Union actions. The development, production and dissemination of European statistics within the legislative framework of the multiannual programme should be achieved through close and coordinated cooperation within the European Statistical System (ESS) between the Union statistical authority, which is the Commission (Eurostat), and the national statistical institutes and other national authorities as designated by the Member States ( 3 ) (collectively, ‘national statistical authorities’). Professional independence of the national statistical institutes and the Commission (Eurostat) is essential for providing credible and high-quality statistical data. When defining statistical areas to be developed, the objectives of Regulation (EU) No 691/2011 of the European Parliament and of the Council of 6 July 2011 on European environmental economic accounts ( 4 ), which relate to the development of new environmental economic account modules, should be taken into account. In order to be considered as financing decisions according to Article 84(3) of Regulation (EU, Euratom) No 966/2012 of the European Parliament and of the Council of 25 October 2012 on the financial rules applicable to the general budget of the Union ( 5 ) (‘the Financial Regulation’), the annual work programmes adopted by the Commission for the implementation of the multiannual programme have to set out the objectives pursued, the expected results, the method of implementation and their total amount. They must also contain a description of the actions to be financed, an indication of the amount allocated to each action and an indicative implementation timetable. It is desirable that they also set out the relevance of the objectives pursued to the users’ needs and a project plan. For grants, they should include the priorities, the essential evaluation criteria and the maximum rate of co-financing. Moreover, the annual work programmes should include appropriate indicators for monitoring outcomes. For 2013, this Regulation lays down a financial envelope for the multiannual programme, which, in the framework of the annual budgetary procedure, is to be the prime reference for the budgetary authority within the meaning of point 37 of the Interinstitutional Agreement of 17 May 2006 between the European Parliament, the Council and the Commission on budgetary discipline and sound financial management ( 6 ). 2. 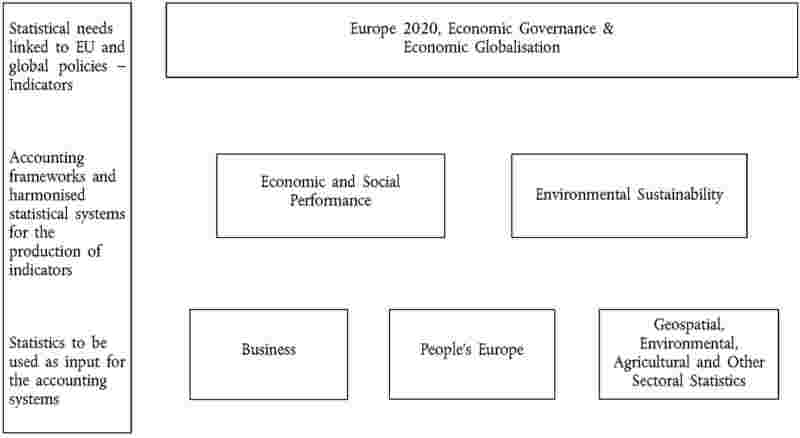 The programme does not cover measures provided for by the Programme for the Modernisation of European Enterprise and Trade Statistics (‘the MEETS Programme’), established by Decision No 1297/2008/EC of the European Parliament and of the Council ( 9 ), until the end of the MEETS Programme on 31 December 2013, but includes objectives in the area of enterprise and trade statistics planned to be implemented from 2014 to 2017. Objective 4 : ensure that delivery of such statistics is kept consistent throughout the whole duration of the programme, provided that this does not interfere with the priority-setting mechanisms of the ESS. — cooperate with statistical bodies at international level in order to promote the use of international concepts, classifications, methods and other standards, in particular, with a view to ensuring more coherence and better comparability at global level. 1. The Union financial envelope for the implementation of the programme for 2013 shall be EUR 57,3 million, covered by the programming period 2007 to 2013. The Union financial envelope for the implementation of the programme for 2014 to 2017 shall be EUR 234,8 million, covered by the programming period 2014 to 2020. 2. The Commission shall implement the Union financial support in accordance with the Financial Regulation. 3. The Commission shall adopt its decision on annual appropriations in compliance with the prerogatives of the European Parliament and of the Council. (b) they have provided the Commission with satisfactory accounts of their membership, internal rules and sources of funding. The European Anti-Fraud Office (OLAF) shall, where appropriate, carry out on-the-spot checks and inspections of economic operators concerned directly or indirectly by such funding in accordance with the procedures laid down in Council Regulation (Euratom, EC) No 2185/96 of 11 November 1996 concerning on-the-spot checks and inspections carried out by the Commission in order to protect the European Communities’ financial interests against fraud and other irregularities ( 10 ), with a view to establishing whether there has been fraud, corruption or any other illegal activity affecting the financial interests of the Union in connection with a grant agreement, grant decision or contract funded pursuant to this Regulation. (c) countries to which the European Neighbourhood Policy applies, countries which have applied for membership of the Union, candidate and acceding countries, and the western Balkan countries included in the stabilisation and association process, in accordance with the conditions laid down in the respective bilateral or multilateral agreements with those countries establishing the general principles for their participation in Union programmes. information compiled by national statistical authorities, on the basis of traditional statistical activities (sample surveys, censuses, etc.) and data from other sources that are reused for statistical purposes. This information is tailored to serve needs in specific policy areas, e.g. the labour market, migration or agriculture. The term also includes data collected for administrative purposes but used by national statistical authorities for statistical purposes (usually referred to as data from administrative sources). Accounting systems : coherent and integrated accounts, balance sheets and tables based on a set of internationally agreed rules. An accounting framework ensures a high profile of consistency and comparability; statistical data can be compiled and presented in a format that is designed for the purposes of analysis and policy-making. Indicators : an indicator is a summary measure related to a key issue or phenomenon and derived from a series of observed facts. Indicators can be used to reveal relative positions or show positive or negative change. Indicators are usually a direct input into Union and global policies. In strategic policy fields they are important for setting targets and monitoring their achievement. — employment indicators distinguishing between part-time and full-time employment, as well as indicators on unemployment that take into account people in activation policies such as training. — implementing a robust quality management in the production chain, also covering upstream public finance data and the underlying workflows in Member States. — the definition, as appropriate, implementation and explanation of a robust quality management framework for those indicators. — the examination of the need to reform the calculation and allocation of financial intermediation services. — the alignment of the corresponding accounting and statistical concepts to the extent possible. — the availability of harmonised housing and related statistics for all Member States. — the development of a headline indicator measuring global environmental pressure. — the provision of statistics on resource use and resource efficiency based to the extent possible on existing data collection. — the commencement of preparations of the next census round (scheduled for 2021). — the integration of statistical data when relevant, thus creating a multisource flexible infrastructure for the provision of targeted spatio-temporal analysis. — A set of key environmental statistics on resources, such as on waste and recycling, water, raw materials deposits, ecosystems services and biodiversity at national and where possible regional level, and a set of key climate change-related statistics to support mitigation and adaptation actions and policies at all relevant levels from local to Union level. — transport safety, passenger mobility, road traffic measurement and intermodal freight transport. — the implementation and dissemination of a set of key forestry data from Integrated Environmental and Economic Accounting for Forestry, such as forest area, volume and value of standing timber and economic accounts for forestry and logging. — the standardisation of quality reports in various statistical domains at Union level. — the communication to users of the statistical areas to be simplified and of the data collection to be reduced/discontinued. — the improvement of the provision of metadata, namely background information on how data are collected, the quality of data and how to render data more readily understandable to users. — the further development and making operational of collaborative networks. — the preparation of data sets to facilitate the use of statistical data for educational and research purposes. — the putting in place of adequate instruments for the exchange of practices and implementation of common solutions in the ESS. — regular stakeholder dialogues at top management level. — implementing the new United Nations System of National Accounts, ESA, the United Nations System of Environmental and Economic Accounts, the European Environmental Economic Accounts and the Balance of Payments manuals. — improving cooperation and coordination activities among the members of the ESS. ( 1 ) Position of the European Parliament of 12 December 2012 (not yet published in the Official Journal) and decision of the Council of 20 December 2012. ( 2 ) OJ L 87, 31.3.2009, p. 164. ( 3 ) Without prejudice to Article 5 of Protocol No 4 on the Statute of the European System of Central Banks and of the European Central Bank. ( 4 ) OJ L 192, 22.7.2011, p. 1. ( 5 ) OJ L 298, 26.10.2012, p. 1. ( 6 ) OJ C 139, 14.6.2006, p. 1. ( 7 ) OJ L 73, 15.3.2008, p. 13. ( 8 ) OJ L 332, 30.11.2006, p. 21. ( 9 ) OJ L 340, 19.12.2008, p. 76. ( 10 ) OJ L 292, 15.11.1996, p. 2. ( 11 ) OJ L 90, 28.3.2006, p. 2. ( 12 ) OJ L 354, 31.12.2008, p. 70. ( 13 ) OJ L 108, 25.4.2007, p. 1. ( 14 ) OJ L 251, 18.9.2012, p. 49.